This sample project creates an AWS Batch job poller. It implements an AWS Step Functions state machine that uses AWS Lambda to create a Wait state loop that checks on an AWS Batch job. This sample project creates and configures all resources so that your Step Functions workflow will submit an AWS Batch job, and will wait for that job to complete before ending successfully. You can also implement this pattern without using a Lambda function. For information about controlling AWS Batch directly, see AWS Service Integrations. Choose Sample Projects, and then choose Job Status Poller. It can take up to 10 minutes for these resources and related IAM permissions to be created. While the Create Project Resources page displays Creating resources, you can open the Stack ID link to see which resources are being provisioned. When complete, the New execution page is displayed, with example input similar to this. After you create your state machine, you can start an execution. On the New execution page, enter an execution name (optional), and then choose Start Execution. Optionally, you can go to the newly created state machine on the Step Functions Dashboard, choose New execution, and then enter the input code using the name or Amazon Resource Name (ARN) of each newly created resource. For example, the input for the previous execution using only the resource names would be as follows. wait_time instructs the Wait state to loop every 60 seconds. (Optional) In the Execution Details section, choose Info to view the Execution Status and the Started and Closed timestamps. 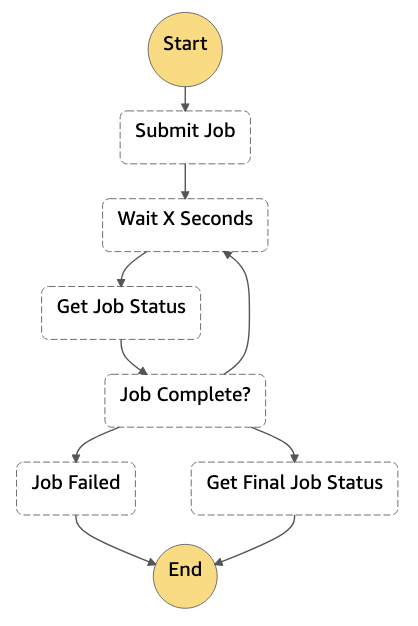 To view the changing status of your AWS Batch job and the looping results of your execution, choose Output.